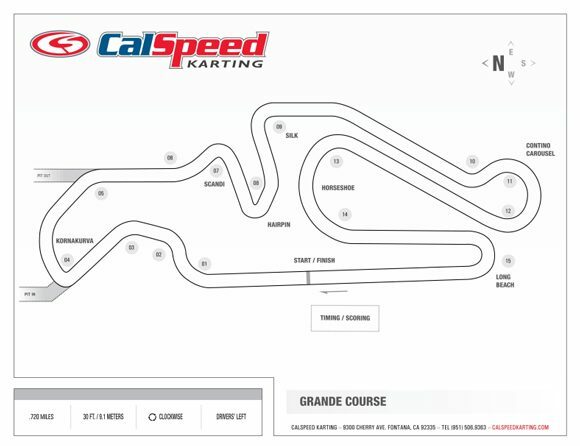 Round #5 of the 2018 CalSpeed Sprint Series rolls through the Grande configuration this weekend, marking the first of four clockwise direction tracks in a row, before finishing things off heading in the reverse direction in the fall. Normally round number five in the season would be the conclusion of the first half of the year, and the deciding round for the Winter Series title. But with round three being postponed in March, that honor will go to Nuovo next month instead, with this weekend’s event acting as the last chance for drivers to get into striking distance. The longest track on the calendar, Grande’s near 3/4 mile distance includes fifteen corners that cover everything from long straights to tight hairpins. Starting things off heading up the main straightaway, the first section is one used in every single clockwise direction layout, ‘The Busstop’. Covering turns 1-3, The Busstop sees many draft passes completed that started up the the front straight, but is also the setup area for moves into turn four, also known as Kornakurva. The big key to getting this section correct is to stay off of the turn two curb by at least a kart width, with your eyes focused on the tires at the turn three apex. Ideally you want to hit the backside of that third apex in the section, as it helps set up your line for the approach to turn number four. And here is a pro tip; get those eyes on the apex of turn four as soon as you have line of sight -typically when adjacent to the turn three curb. This will help the consistency in getting Kornakurva correct, and can help you capitalize on mistakes from drivers in front. Once out of turn four, we head down the hill in a smooth arc past turn five, and the end of the common section for clockwise tracks, and into what makes Grande unique: the ‘Scandi’ into ‘Hairpin’ complex. There are a couple ways that one can approach Scandi, but there is one goal shared by all, and that is to make sure to sacrifice it enough to get Hairpin right. The first way is to drive over the curb, braking while on top of it and while you transition off, while the second way is to brake on angle across the last part of the curb without hitting it. In the video I demonstrate going over the curb, but this is not always the easiest way of attacking Scandi, since the curb can upset the kart under braking. Either way, the important thing is to get the kart slowed down enough, but still rotated to get to the back side of the right hand curb at apex. This is because it is the second corner in this pairing that is the more important one, as it leads onto the back straight section, and with it a great chance to make up time. While important, the Hairpin is really pretty straight forward, provided you got Scandi right. Get all the way over to the right, a small left of the throttle at turn in, and immediately back on the throttle while letting the kart exit out towards the curb. Give yourself a little cushion -maybe a foot or so- between the curb on exit and yourself, as you may need it if it doesn’t go perfectly. Once out of Hairpin, it is flat out through Silk and down the back straight until you reach the ‘Contino Carousel’, the second of our three braking zones. Here you want to stay on the throttle as you go over the curb on the left, focusing your vision on the second curb, exactly like how we do in Scandi. Braking once you get over the curb, you need to turn in a little sooner than you think, getting close to the first curb before letting the kart float up a bit in the center of the corner. You can stay off the second apex by about a half a kart width if you’d like, exiting a bit wide before working back over to the far right side in your set up for ‘Horseshoe’. Full throttle since getting back on the gas at the first apex of Contino, carrying maximum speed while taking a short distance are the goals through Horseshoe. Clipping both apexes with just a little float up the track in the middle is the smoothest way to go, carrying your speed on exit towards the final braking zone -and arguably best passing zone- Long Beach. This 180-degree corner is actually a bit quicker than the aforementioned Hairpin in the center of the track, but carries with it even more importance given it leads to the longest straight, and is the final corner before getting to the stripe. We are going near our top speed on entry to the braking zone, which is pretty hard since we need to take a little later apex here. We want to make sure we get good drive off, so make sure you are in the center of the curbing, not the early half. Get your eyes on it and turn your head on approach, and you can also keep from getting surprised by those pass attempts. I talk about all of that for the newer drivers in the series, as we could see many new faces towards the sharp end during the second half of the season with the knowledge of how to get around most of the tracks. That could make for a pretty big shake up for the Summer Series sub-championship that runs through the final five races, but I am getting ahead of myself a bit. This weekend would typically be the decider for the Winter Series championship, but with the postponement of round #3, we’ll have to wait until next month to crown our first champion of the 2018 season. This weekend instead sees the last chance for anyone looking to get into striking distance to fight for that championship. Remember, it is best 4 out of 5 rounds for the Winter title, and with many drivers already having a tough round in the opening three, very few have a cushion to fall back on. Here on Grande, the familiarity of the course could lend itself for some of the more experienced to create an advantage in the points, as next month’s contest on Nuovo will have the series re-visit a previous track on the schedule for the first time. 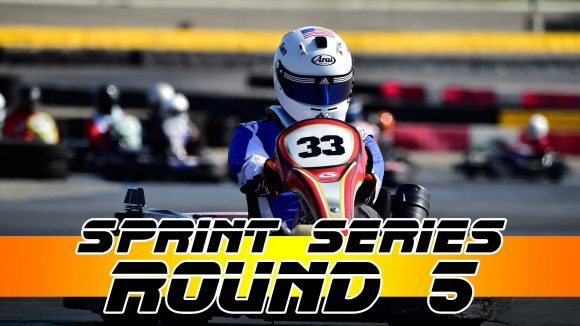 Round 5 of the Sprint Series is here and the overall points battle is very fun to watch right now. The absent Diego Alvarado is still our points leader on paper, but just below him on the chart is both Spencer Russell and Sam Hunt who are currently tied. Both of these drivers had a very solid round four where they both stayed in the top two the entire day. 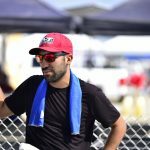 It is not quite the halfway point of the season, but I feel that a lot drivers have now come into their own and are starting to settle in to a normal spot in the pack. Grande forward; one of the tracks I look the most forward to throughout the year. Usually drivers struggle with the Grande section (Scandi- Hairpin); making sure to not overshoot the downhill so that you’re set up for the hairpin is crucial. Missing your mark in Scandi can hurt you quite a bit more than other spots on this track, and you can be left with very little speed and too shallow for the hairpin, leaving you with no momentum for the back straight. In my opinion this is a course where the kart can start to “drive you”. In my experience, you really have to tell the kart where to go. The two corners that come to mind are Contino and Scandi. Both corners have a decent amount of entry speed, are easy to overshoot, and the kart can become a handful. 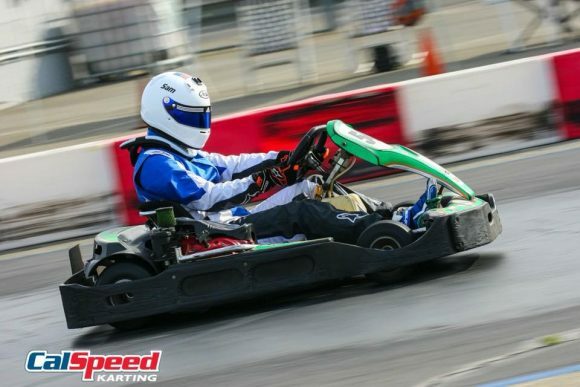 Getting the kart set under braking is huge; being smooth on the pedal and not locking it up. If you’re not doing the Race Clinic and have not been on this track before, I recommend going over some Super Series footage. You’ll get a good picture of how the line is and also what to expect with the racing. Grande is probably one of the best tracks to hold the outside on. If the driver on the inside does their job and gets the kart slowed down, you can have a decent run on the outside and have the preferred line for the next corner. I’ve seen a lot of close racing on this layout, and I think it’s because the way the track drives with a decent amount of single file. When going for the next spot, think about the exit and where you’ll end up. Yes it’s easy to go two wide, but it’s that much better to get the pass completed in that one corner. Good luck to everyone this weekend! I’m looking forward to some close racing and seeing how this points battle develops throughout the rest of the season. See you Saturday! 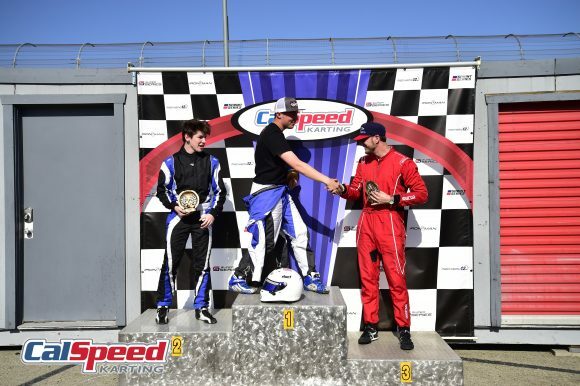 For the third round in a row we saw a new winner, as Sam Hunt added his name to the shortlist of Sprint Series winners. Picking up his first ever win saw him surge forward in the standings with one drop calculated, actually currently tied with fellow round #4 podium driver Spencer Russell. Russell is actually the point leader via tie breaker (total points), having not strayed from the top six yet in the A-Mains. Ivan Martinez is third of full time runners, but is the driver with the second best ranking in total points next to Russell. He too has been a staple at the sharp end this year, even picking up his first heat win last month. Next is the round #2 winner James Lieser, sitting fourth of the full time drivers and looking to bounce back from a little tougher round last month. Rounding out the top five full time drivers in the Sprint Series is Randy McKee, who has actually scored the third highest point total however, and owns the second highest drop of any driver currently. It was also on Grande last Spring that we saw he was a contender for the first time, snagging his first Sprint Series podium; this could be the weekend he turns it up a notch. These top five have certainly showed the consistency, or at least the prowess to get the job done at the sharp end, and have a bit of an advantage over the other drivers in the top ten currently. This is mostly the case when talking about the Winter Series sub-championship, as only one drop is taken into account. When we do add the second drop after this weekend’s event, expect to see the points tighten up a bit, with some drivers running under the radar working their way buck up the charts.